May 2013 Ahi Rule May! We are still waiting for the big blue marlin to show up but the porpoise schools are loaded with bruiser ahi! This month we did really good and managed a 7 ahi day! We missed three others! On this trip California residents Jeff, Darrell and Carla fished Kona for the very first time. We found a big porpoise school that was absolutely loaded with big ahi. On our first pass we took a double trolling lures. One came off but Darrel did a great job and landed his in about 15 minutes. Ahi were jumping everywhere but refused our trolled lures so I went to the greenstick in hopes of getting more to pile on. We got bit immediately on the greenstick and Carla was up landing hers in about 10 minutes. The next few hours hours were a blur as we ran back ahead of the school and switched to live bait. 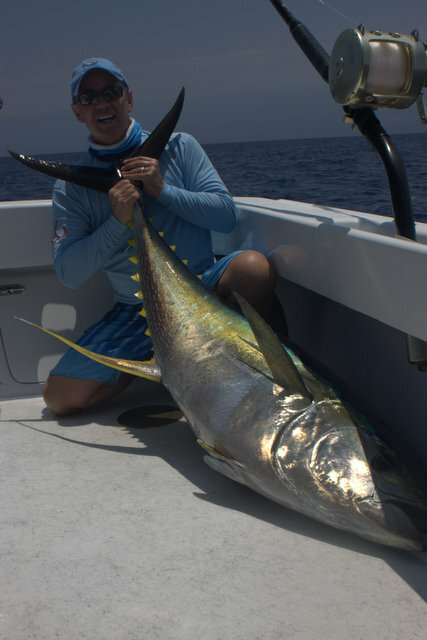 The baits weren’t in the water for more than 5 minutes before a big ahi blew up on them! It was almost as fast as we could go and before we knew it 7 were lying in the brine of our fish box. Full up we called it quits at 1pm and trolled back to the harbor! Return client and good friend Mike from Seattle also caught a nice ahi while fishing with me. Mike and his wife are planning on moving here one day so I’m sure we’ll be seeing even more of them! Russ and Myra also had a great trip landing 4 big ahi between the two of them! 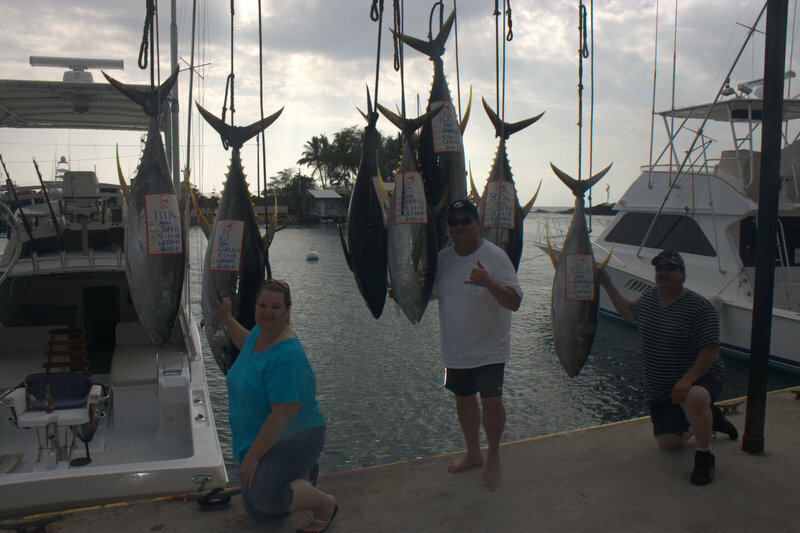 Soon after return client Ken of Pacific Seafoods returned to catch 3 nice ahi and a 35lb spearfish. 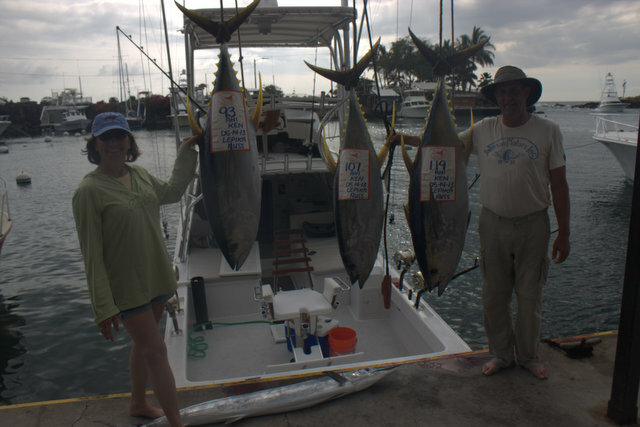 Another return client Mike and Barbara brought their daughter for three days on the Lepika. We lucked out on all three days and caught them some really nice ahi as well. 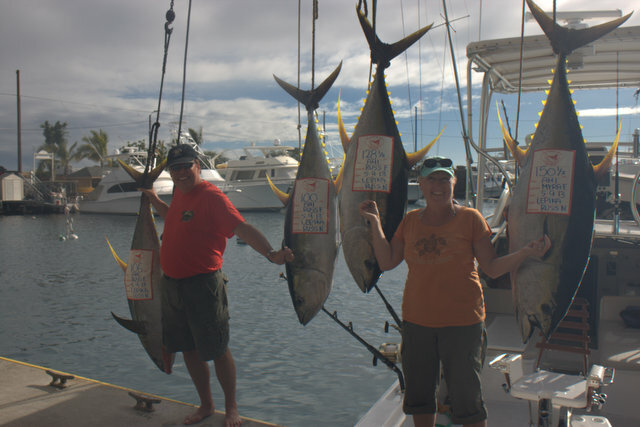 First time clients Gary and Carole also had a great trip landing three big ahi as well!